"One Family. Eight Wheels. No brakes." 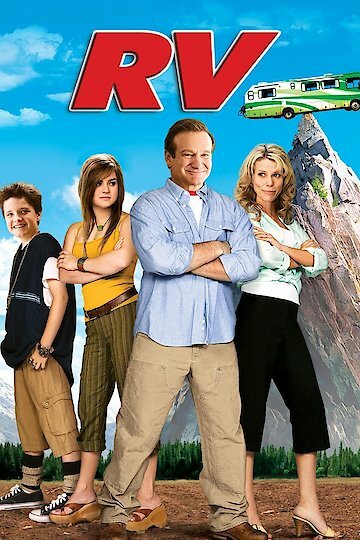 Starring Robin Williams ‘RV’ is the story of white collar workaholic, Bob Munro, who feels the pressure of stress at the possibility of losing his job and the yuppie lifestyle that he has come to rely on. However, on the other hand Bob is also receiving pressure from his wife, Jamie, daughter Cassie and son Carl, to spend more time at home and be more involved in their lives. Bob, agreeing that he is indeed missing out on the family he loves, agrees to take the family to Hawaii for a vacation, however, Todd Mallory, Bob’s abusive boss, gives him the ultimatum that he must prepare a presentation for a perspective client as well as attend the meeting. Bob, not wanting to lose his job or disappoint his family, devises a plan to take a road trip to the Colorado Rocky Mountains in order to attend the meeting and spend time with his family; hence he rents an RV to give the family time together. Although they aren’t that enthusiastic at the idea of a cross country trek, Bob’s family agrees to the proposal and try to adapt and make the best of situation. Along the way the Munro’s learn a number of new and interesting lessons; such as the proper method to handle the septic waste hose when you’re emptying the chemical toilet; a lesson Bob realizes he should have studied before his first attempt. Not only are there new lessons learned, but there are also new friends to be made, such as the Gornickie family, who help the Munros find their way in the RV culture. While Bob’s main motivation may have been to make his meeting along the way he quickly learns that there is more to life than the almighty dollar and chasing the next deal. Combined with lessons and laughs 'RV' offers scenic views as well as plenty of fun and family oriented entertainment. RV is currently available to watch and stream, download, buy on demand at Netflix, Amazon, Vudu, Google Play, FandangoNow, iTunes, YouTube VOD online.